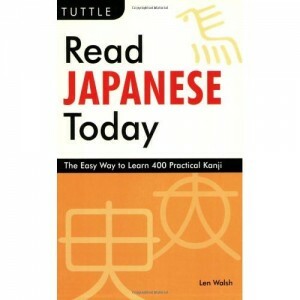 Read Japanese Today: The Easy Way to Learn 400 Practical Kanji by Len Walsh is a practical kanji textbook for beginners. This 224-page book from Tuttle Publishing teaches you how to read 400 of the most useful kanji characters. First published in 1969, the revised edition of 2008 has been substantially updated and includes 100 more kanji characters so it’s worth buying even if you have the original version. Read Japanese Today explains the origins of the kanji, which helps you to remember them and also helps you to read kanji that you haven’t seen before. It is easy and fun to read because the book shows how many common kanji characters evolved from pictures. A hiragana table and a katakana table are included, as is a table summarizing the 400 kanji presented in the book, in edition to the index. from Amazon for just $13.97!